Internationally-renowned duo for voice and lute Mignarda returns to Cleveland for a special performance in tribute to the life's work of an important scholar. 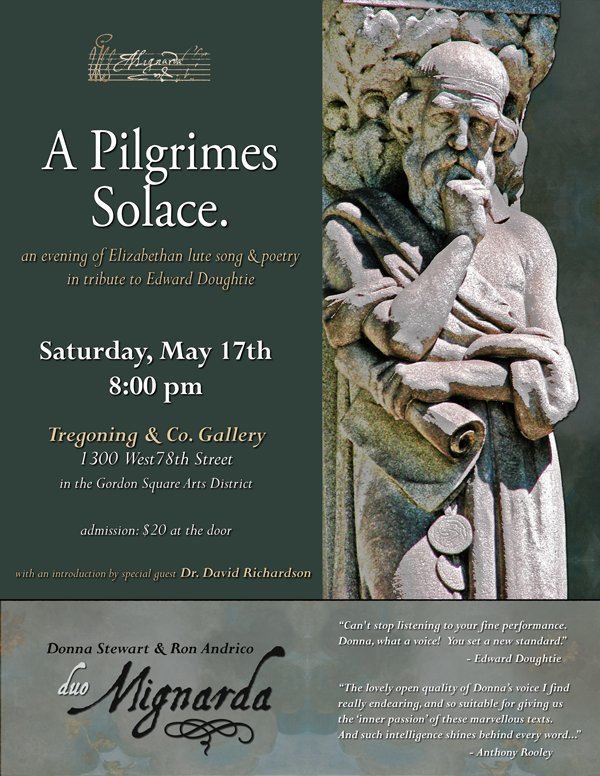 Saturday, May 17th at 8pm, at the beautiful Tregoning & Co. Art Gallery, lute song duo Mignarda will present an evening of Elizabethan lute song and poetry in tribute to Edward Doughtie. The song texts are from the pens of important poets who lived in the age of Shakespeare; evocative poetry with a surprising emotional content set to music that ranges from compelling counterpoint to clever, sparkling and downright danceable. The program will feature music from Mignarda's 2013 CD recording of John Dowland's last and best book of songs, published in 1612. To complement Dowland's highly sophisticated music, the program will also include settings of lute songs by his contemporaries Thomas Campion, John Danyel, and Robert Jones. The concert is a tribute to Edward Doughtie (1935-2014), whose work in the field of the literary sources of English lute songs became a standard reference, and was the inspiration for many of Mignarda's poetically-themed programs. There will be a special introduction by Doughtie's colleague, Cleveland's own Dr. David Richardson, and the program will conclude with some new compositions for voice and lute including a modern lute song composed by Edward Doughtie. Cleveland natives Donna Stewart & Ron Andrico, better known as Mignarda, are well-known to Cleveland audiences and one of the few professional lute song duos in the US. Dedicated to music of the 16th century, Mignarda's engaging approach has set a new standard for interpretation, authenticity and musicianship. Based in rural upstate NY, Mignarda performs throughout the US with an international audience for their ten critically-acclaimed recordings and a growing series of editions of historical music for voice and lute. Mignarda's CD, Divine Amarillis, received the 2009 JPF Best Classical Vocal Album Award, and the duo maintain an active schedule in touring, recording and teaching. In additon to live performances, their music has gained international exposure through radio and television broadcasts across the US. Professor Richardson devoted much of his academic career to British Renaissance literature, with special attention to Edmund Spenser, biography, and rhetoric. He initiated and was Managing Editor of The Spenser Encyclopedia (1990) and edited four volumes of 16th-century British Nondramatic Literature (1993-96) for the Dictionary of Literary Biography. After retiring from CSU, he helped develop academic programs for baccalaureate and graduate degrees from eight Ohio colleges and universities for site-bound students near Cleveland on the campus of Lorain County Community College (LCCC). He initiated Meeting Great Minds, a lecture series to bring stimulating minds to campus for close interaction with high-school and college students. From one such encounter, he initiated LCCC’s Fab Lab and the Fab Lab Network. Richardson has now officially retired twice but continues consulting about Fab Labs. He also enjoys hosting play readings, listening to chamber music, reading historical anthropology, hunting, jogging, and following Voltaire’s advice about cultivating miniature tomatoes. Once, while his wife looked on with wild surmise, he swam with Hector’s dolphins in New Zealand.